Twitter has provided me with some of the best professional learning of my career. It’s likely the most important tool for my own growth and learning as an educator. With Twitter, I’ve networked across the world, shared my students’ work and stories, made friends, and learned so much. For me, the true power relies in both Twitter’s reach and its flexibility. Every Tweet has power. But when my tweet can get retweeted, and that gets retweeted, the power becomes exponential. In seconds and with just a few clicks, my question, message, or work is shared with my network and with the world. When I have a question or need help, Twitter is one of my first destinations. With Twitter, your reach is unlimited but so is your purposeful use of the tool. You can decide how to use it. Do you follow EVERYONE? Or just a select few? Are you searching all education chats or just your favorites? How much time do you want to dedicate to this platform for connection? With Twitter, you are in control, creating a social learning experience to meet your needs. Below, I share tips for getting started with Twitter for teachers. The list is not definitive or exhaustive, but it’s true to how I’ve made meaning of Twitter over the past few years. For more tips, take advantage of social media or Google and you will find dozens of more intricate articles and guides. And be sure to check out 140 Twitter Tips for Educators: Get Connected, Grow Your Professional Learning Network and Reinvigorate Your Career by #Satchat founders and Evolving Educators, Brad Currie, Billy Krakower, and Scott Rocco. Add a bio with a location and some interests and any validating links, like a blog or website. You want to represent yourself and your interests clearly to make it easier to connect with other like minded users and educators. Keep it all public to really be able to take advantage of the power of Twitter; I often don’t follow users with private profiles because I can’t see if their Tweets would be of interest. For me, Twitter is a public space. Start building your PLN: a personal/professional learning network. Follow educators and users that you want to learn from and connect with. A good way to start is to pick a user you know you want to follow, and then to see who they follow. You can also find curated lists on websites like Cybraryman’s, listing educators to connect with by subject area. Many educators will follow other educators back; others are more selective. For some, each follower is a dedicated commitment. Others follow lots of people. There’s no right or wrong to it, but follow and engage in the online community to increase your connections. Retweet good content, follow interesting users, and comment on links or ideas you appreciate. Ask questions, provide feedback, and interact when you can. Some of my real friends today started with a favorite or retweet on Twitter. Edutopia has a great article with more: How Do I Get a PLN? In addition to following users, keep an eye on hashtags to take Twitter to the next level. Hashtags help curate content and make it easy to find what you are looking for. Want to learn about upcoming conferences? Check out #TheEduCal. Interested in the teaching of English? Try #engchat. Nearly every content area and age level have dedicated hashtags, as do books like Teach Like a Pirate (#tlap) and more. Find a guide to education hashtags on TeachThought and get started. Sometimes, I’ll ask a question or send a Tweet with a specific hashtag and at times, I’ll just search a hashtag to find interesting content. For example, when I have a Google question, I’ll use #GAFE, #GAFEchat, or #edtechchat in my Tweets because other users are likely following the hashtags, too. Often, they can help me find what I’m looking for. Other times, I’ll have an open search for a hashtag like #NYEDchat or #NJED to see what’s going on in the NY/NJ areas. Use a tool like TweetDeck to help keep your hashtag searches organized for efficiency and ease. Hashtags aren’t just for tracking topics and interests, but they also help facilitate Twitter chats. Take your hashtag game to the next level by participating in a chat that meets your interests or needs. For example, #satchat takes place from 7:30 - 8:30 EST every Saturday morning, with rotating topics and guest posts on all things education. Be sure to check out the Education Chat Calendar for a full list of chats to explore. You can also use a tool like Participate Learning to help manage the chats easily. Education Twitter chats are happening nearly all day every day, connecting users around the world. Pick one that’s relevant to your educational interests, and give it a try. If you are new to Twitter, worrying about PLNs, hashtags, chats, and tools is probably a little overwhelming. I’m overwhelmed sometimes, too. The most important advice I have for any teacher new to Twitter or ready to give it another shot is to start small. I Tweet constantly and am always checking the stream of new messages and links on my phone. Sometimes I’ll read and explore for a few minutes; othertimes it's seconds (and rarely, still, hours). They all work just fine. Do what works for you. Twitter is as much of a commitment as you want it to be. The more of a chance you give it, the more payoff you are likely to see, but start small and grow from there. How do you use Twitter to learn, grow, and make connections? 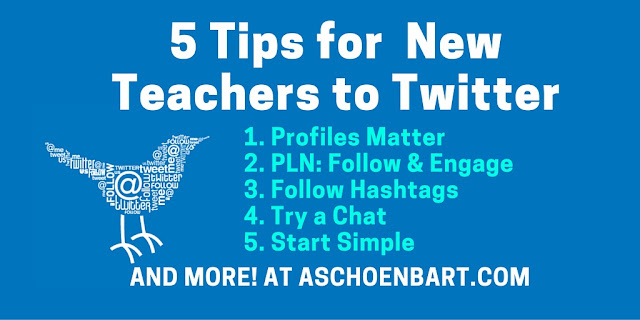 What tips do you have for educators new to Twitter? Share in the comments below or on Twitter @MrSchoenbart.